Synopsis: The haunting story of The Giver centers on Jonas (Brenton Thwaites), a young man who lives in a seemingly ideal, if colorless, world of conformity and contentment. Yet as he begins to spend time with The Giver (Jeff Bridges), who is the sole keeper of all the community’s memories, Jonas quickly begins to discover the dark and deadly truths of his community’s secret past. With this newfound power of knowledge, he realizes that the stakes are higher than imagined – a matter of life and death for himself and those he loves most. At extreme odds, Jonas knows that he must escape their world to protect them all – a challenge that no one has ever succeeded at before. The Giver is based on Lois Lowry’s beloved young adult novel of the same name, which was the winner the 1994 Newbery Medal and has sold over 10 million copies worldwide. Lois Lowry’s “The Giver” is a seminal work of Young Adult fiction. It’s the type of novel that you either read in grade school or you pretend like you read it to avoid ridicule. This story is so beloved that, up until now, it has been deemed unfilmmable. Yet, in the right hands and with the right script, a “Giver” film has always had the potential of becoming as treasured as its literary counterpart. And in some respects the cinematic adaptation of The Giver comes close to achieving that goal, but a weak second half ultimately does this one in. For those who may not be familiar with the story (or who pretend like they do), The Giver imagines a world where there is no diversity. Society has lived for decades under a single regime and for the most part that has led to perfect harmony. However, in the pursuit of peace, this self-contained community has phased out everything else: emotions, sarcasm, memories, relationships, aspirations, and even color. It’s the picturesque dystopia and only Jonas (Brenton Thwaites) seems to notice that things are not as perfect as they may seem. He can’t quite put his finger on it, but when Jonas is appointed the new Receiver of Memory – a distinction handed out on very rare occasions – he discovers that his community’s faÃ§ade is hiding some dark secrets. But with the help of the last Receiver, who has now become The Giver (Jeff Bridges), Jonas believes he can bring all the good (and the bad) back into his community. Although The Giver is a widely known story, the film tries its best to introduce this world, establish these unique characters, and then tell an engaging story, all within 90 minutes. As a result, some elements feel more underserved than others, specifically the film’s central conflict. For the first half hour or so The Giver has an undeniably fascinating sense of discovery – it’s clever and well paced, and sets a great tone – but when it comes time to get to the nuts and bolts, the film starts to come apart at the seams. Even those initially engaging elements are not without their faults either, as The Giver‘s narration, while important to the world building, is extremely clunky. Brenton Thwaites is fine as young Jonas, but he’s not the charismatic lead you’d hope for. His delivery is flat, his face is nearly emotionless, and for a character who’s slowly supposed to be developing emotions and feelings, the casting becomes a major distraction. 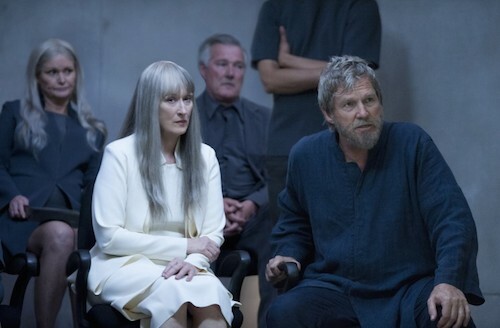 Luckily, The Giver‘s supporting cast, mainly Jeff Bridges, does well to prop up the film. Bridges may not be the film’s emotional center, but he is its most compelling character. Meryl Streep also does well as the community’s cold leader, but her performance is too distant to be engaging. For the most part uncovering the layers of The Giver‘s world is easily its most appealing quality. However, when the film transfers from set-up to conflict it loses a lot of that good will. Not only that, The Giver‘s core concepts, namely how this society has suppressed emotions and memories, become even more confusing. It’s easy to accept these ideas from a superficial perspective, but when they become integral to the plot things begin to fall apart. And where the first half of the film was initially about the slow buildup and quiet intrigue, the latter half tries to shoehorn some generic chase sequences for no other reason than to make an interesting trailer. It’s a tale of two halves for The Giver, where the early 45 minutes or so set up an engaging dystopian world and the second half turns all that into a series of generic “action sequences.” However, because the first half is so compelling, it doesn’t make The Giver a complete wash as far as sci-fi or book fans are concerned. Granted, the film does take some heavy liberties with its source material, but the spirit of Lowry’s tome feels well preserved, at least at the outset. Even the filmmaking reinforces some of “The Giver”‘s more unique qualities, specifically how this society has squashed any and all forms of diversity. But it’s the awkward tonal shift from world-building to conflict that is The Giver‘s ultimate undoing. Admittedly, The Giver film takes more than a few liberties with Lois Lowry’s book, most evidently in the final third, but where its script most succeeds is in the set-up. World-building is never easy in these types of dystopian affairs, and for the most part The Giver establishes what it needs to in such a short amount of time. In fact, it is the discovery that is The Giver‘s greatest strength, as audiences learn more and more about this dystopian world. Again, it may not be the world of Lowry’s “The Giver,” but it’s nonetheless fascinating. Where the script starts to fall apart at the seams, however, is in its conflict. Once we get from the why and the where to the what, The Giver becomes a formulaic dystopian tale with some confusing motivations. As Jonas begins to unravel the harsh truths of his reality and make some tough decisions about his future – i.e. when the film starts to transition from set-up to plot – The Giver becomes less and less compelling and more generic. It comes close to asking some bold questions about our society and making even bolder artistic statements as a film, but it never gets all the way there. It might be a bit gimmicky but The Giver‘s use of black and white helps communicate concepts that would otherwise be unclear. With it, the film reinforces its dystopian themes of uniformity, showing every main character as having the same skin tone, hair color, and clothing without actually altering each actor’s wardrobe. And then, as Jonas begins to learn more and more about the world outside his perfect community, the film slowly starts to add splashes of color into the presentation, until the film inevitably transitions into full color. For most films, the use of black and white is a stylistic choice, but here the decision reinforces the film’s themes. It may make The Giver a littler harder to swallow for younger demographics – which might also hurt its appeal as a YA adaptation – but it works to stunning effect. Few films in recent memory, aside from perhaps Pleasantville, have used the interplay of black, white, and color for more than just style points.